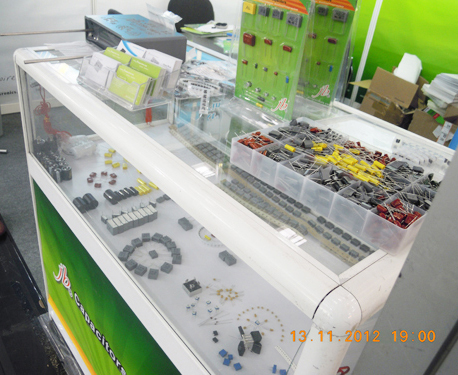 Our company was back from 2012 Electronica Munich Fair with great success.! ^_^ Booth No. B6.437/5 on Nov. 13th~16th, 2012. As our JFV X2 have ENEC, VDE, UL safety approvals for voltage 275VAC, 305VAC, 310VAC. used in white goods, power supply, power meter, and lighting industry etc..
Another most popular serie is our JFX series Axial MKP film capacitors specially used for high end audio products. 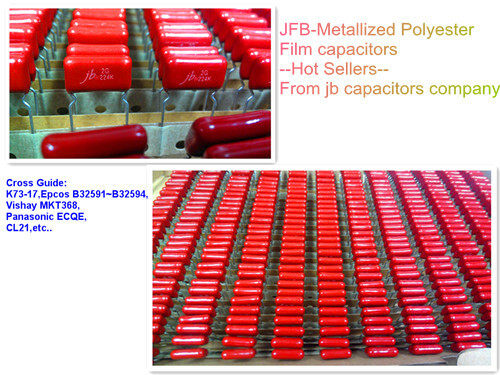 welcome to visit our website www.jbcapacitors.com for details, we also look forward to your inquiry and orders! Thank you ! We jb capacitors company always give great support to our customers. Below we have four green leaflets prepared for our customers. 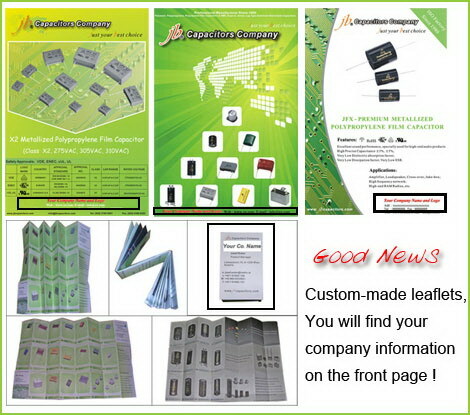 We welcome custom-made the leaflets, you will find your company information on the front page. Please refer to below details for your kind reference. SMD/CHIP Aluminum Electrolytic Capacitors, Snap in, Screw and Photo Flash Aluminum Electrolytic Capacitors. JFV --X2 Metallized Polypropylene Film Capacitors, also called Class X2 Interference Suppression MKP Film Ccapacitors. It is is our top sellers on markets, with ENEC, VDE, UL safety approvals for 275VAC, 305VAC, 310VAC. JFX--Premium Metallized Polypropylene Film Capacitors , Axial lead. It is specially used for high end audi products,eg: Amplifier, Loudspeakers, Cross-over, juke-box and high frequency network. Please let me know freely if you are interested in this offer. 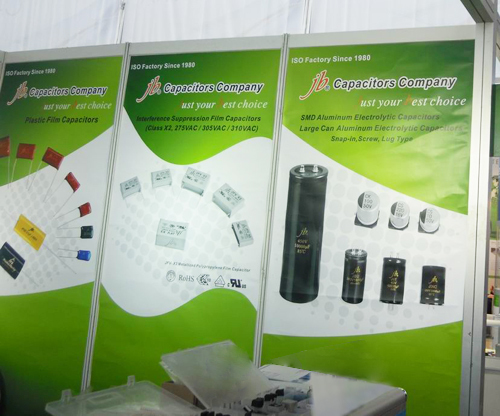 We are ready to help you in promoting jb capacitors products and win more business chance. From each HK electronicAsia fair, Electronica fair in Germany, Expo Electronica fair in Moscow, our JFX always can catch customer's eyes. With high end quality and excellent appearance. below is our picturer for you, very nice, right ? JFX is excellent replacement for Mundorf - MCAP MKP, Jantzen Audio, Mallory, BENNIC, SCR / SOLEN, ERSE etc. but with more competitive prices. in order to promote more for our JFX audio capacitor, we support 100pcs MOQ each item for first order with also very good prices. jb is an old brand for producing full kinds of film capacitors since 1980. We offer full series of MKT, MKP,MKS film capacitors with high quality. JFV Class X2 MKP film capacitors with ENEC, VDE, UL safety approvals for 275VAC, 305VAC, 310VAC!! As specialist in producing a wide range of film capacitors have almost 32 years, our axial type film capacitors is our popular series due to the superior quality and good appearance. So it is my great honor to take this chance to introduce our popular item: JFG - Axial Metallized Polyester & Polypropylene Film Capacitor to you. JFGD Axial Metallized Polypropylene Film Capacitor (FLAT OVAL SHAPE). If you would like more information on our products. pls. feel free to email me: crystal@jbcapacitors.hk, and give us opportunity to quote the price to you.It is our commitment to work hard to cut down the cost for your company and provide you with our best service. We look forward to hearing from you and helping with all your electronic component and value-added needs. Do you buy dipped type MKT film capacitors? Our JFB series, cross to Epcos B32591~B32594, quality is very good, most important is prices are unbeatable, see below our picture. Address: Hong Kong Convention and Exhibition Centre.